Ever watch Masterchef and wonder what it'll be like tasting the food they've made? Ever wonder if you could try several fine dining restaurants a day? Ever wish that you don't have to pay so much for it? Well, you're in luck! TasteMIGF does exactly that! One of the dishes showcased at the Pre-launch Event and it looks absolutely divine. In summary, TasteMIGF is a yearly event where chefs from different restaurants and hotels gathered and showcase their skills in the culinary world. Such as the picture shown above, it is done by Chef Audrey Chin (She has my surname! ahhaha) from Graze Restaurant located in Hilton KL. Happening on the 26th to 28th of September, TasteMIGF will be held at Sunway Pyramid Convention Centre. Another beautiful looking dish by Chef Thierry Le Baut with one of my favourite fish, Cod. For those who are interested in joining the TasteMIGF event happening from the 26th September (Friday) till the 28th September (Sunday), all that is required are Gourmet Dollars. Gourmet Dollars are a temporary currency used during the TasteMIGF event. It comes in a form of RM5 per piece, and a total of 10 a booklet. So its pretty much RM50 per booklet. Not to worry as everything during TasteMIGF will only cost you RM5 per serving with some going up to RM10. So even with RM50, you can try an average of 8-10 different dishes from various fine dining restaurants and/or hotels! I've had some of their dishes during last year's TasteMIGF and it was pretty amazing. Especially the Ebi Katsu and Eclairs with Golden Paper. Will definitely go back this year to try out what they've accomplish in a year. Despite the plating being a little dispersed, I appreciate the vibrant colours and contrast from the black plate. Furthermore, the ingredients used really attracted me. 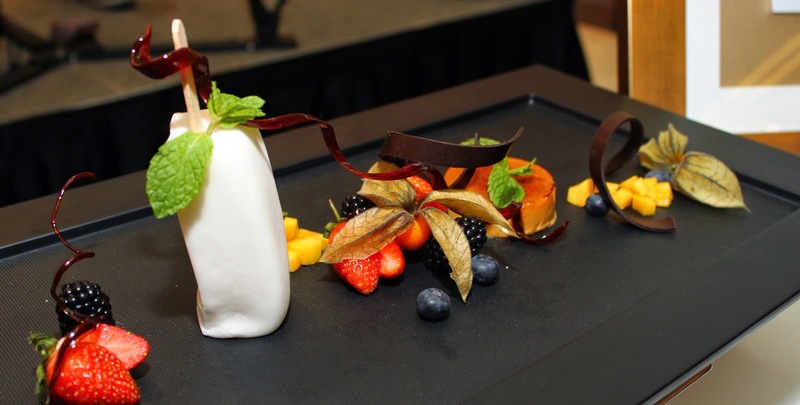 Besides the TasteMIGF event, there are also other functions happening such as the Epicure International Gourmet Village, links to last year's EIGV http://www.findingfats.com/2013/09/taste-malaysian-international-gourmet.html. Here, more than 80 purveyors of the finest gourmet food, wines, cigars, and much more offers their wares in a festive, bazaar-like atmosphere. A rather blur picture but I must share it nevertheless. 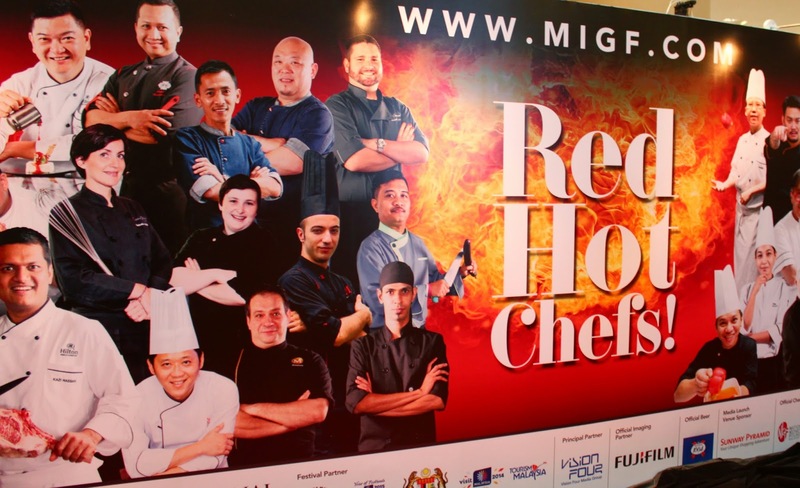 Here are the compilation of all the chefs participating this year and the theme, Red Hot Chefs (last year's being Cool Chef). I just had dinner here and despite my absolutely strict taste, I had an amazing experience at events in NYC and I thought to myself that this place is perfect!